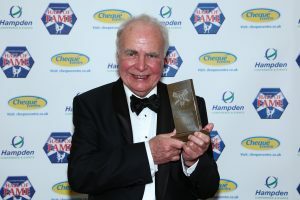 Sports Journalist: Hugh McIlvanney started off as a news reporter with his home town newspaper, the Kilmarnock Standard, before moving on to the Daily Express and the Scotsman, where he was persuaded to take up sports writing. In 1962 McIlvanney joined the Observer in London and would enjoy a long association with this newspaper, holding the position of Chief Sports Correspondent. He moved on to the Sunday Times in 1993 where he was Chief Sports Writer. Hugh has the unique achievement of being winner of the two British Sports Journalist of the Year awards a combined total of a dozen times. He is the only sports specialist to have been voted journalist of the year in the USA. He’s been honoured by the Boxing Writer’s Association of America for excellence in boxing journalism. He was awarded the OBE in 1996, received a lifetime achievement achievement award from the Scottish Daily Newspaper Society in 2004 and in 2005 was among the first 40 journalists to be inducted into the British Newspaper Hall of Fame. A regular contributor to TV and radio, Hugh has written and presented several documentaries including the highly acclaimed ‘The Football Men’. Since 2004 was Chair of the Scottish Football Hall of Fame.